The former Miss Universe wrote a heartfelt note cherishing the good times she shared with Ricky Martin. Sushmita Sen may have dated many men in her life, but she has always had her priorities right. "Marriage hasn't happened. It will happen when it happens," she'd once declared. The 42-yr-old model-actor recently got nostalgic and shared an old photograph of her and Ricky Martin on Instagram with a warm note. 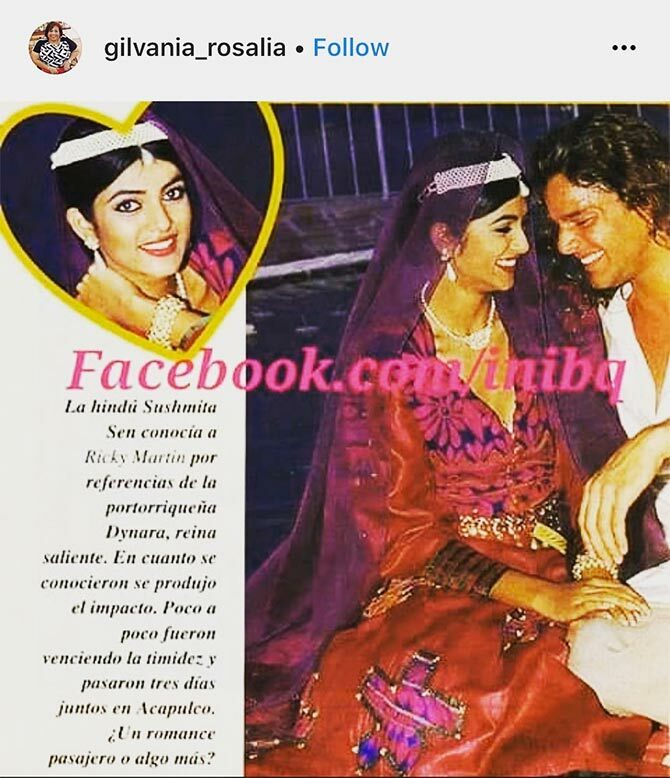 Sushmita thanked Gilvania Rosalia, a Ricky Martin fan for sharing their picture. "Our first meeting in Mexico, Las Brisas, Acapulco. I was 18 years old and Ricky Martin was 22 then!" the former Miss Universe wrote. "Now, I have two daughters and he has two sons born from the heart. "Our journeys have truly embodied “Livin La Vida Loca”, literally meaning ‘the crazy life’. "Sharing memories smiles of a truly wonderful soul! To your happiness, Ricky." After Sushmita won Miss Universe, she and Ricky were together for a brief while. In 2010, when the pop sensation revealed his sexuality, Sushmita was among those who supported him. "All the time I have known him, I’ve been so proud of him. It takes tremendous courage to accept your own DNA. I knew he was gay. More power to him. It is a fantastic feeling to be able to love who you want to and that’s a choice no one can make for you,” Sen told DNA.